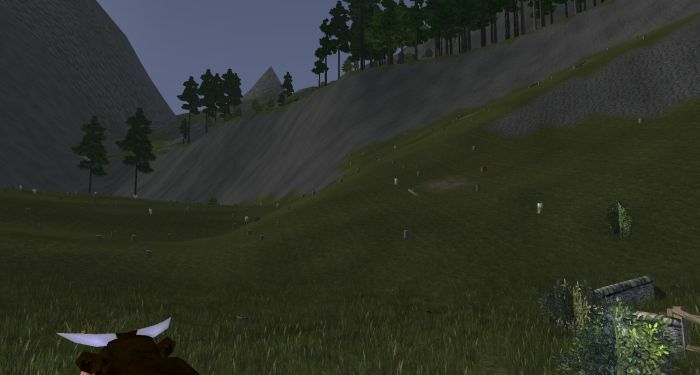 The Grey Lines of Griefing With Proof #WurmOnline – Nomadic Gamers, eh! Anyone who has been reading my blog posts these past few months knows just how much I love WurmOnline, and how I’ve never had any issues in game – until these last two weeks. These last two weeks have almost completely undone everything I love about the game, and the worst part is there’s nothing that can be done about it because it’s one of those shady grey areas of griefing. Pictured above is the forest (well, it used to be the forest) just below my deed. It is right in front of and around the deed of a friend of mine, and to the side of yet another friend. There are four of us in the area, most of these trees were planted by us. We don’t technically own the woods because it’s not deeded, but we’ve been living here happily for months now. Up on a hill away from this forest lives the griefers. It started out innocently enough. [14:14:14] <Zeno> is “cabin fever” your house? [14:20:09] <Stargrace> Why do you ask? From there it quickly went downhill. [14:59:58] <Stargrace> Very sorry to hear that. I’m glad they help me. [15:01:18] <Stargrace> Manipulative? I haven’t even done anything.. While these conversations were going on, my neighbours at my deed were being broken into by one of the members of their village, and their horses stolen and moved up the side of a gigantic hill. I actually watched them walk home (as I myself was walking home) with a few of the horses, but I had no idea at that time they were stolen. At the time of the conversation I had applied to be a CA, but was not yet accepted and didn’t want to jinx it, so I left it quiet. [17:44:48] <Zeno> fippys farm is yours? On the eve of that day my perimeter is broken into, and my cows stolen / killed / let loose in the forest around my deed. I find out the day after as I log in and notice all 25 animals missing. I work all day along with a few friends to re-build my pens on-deed so that they can not be broken into any more and hopefully prevent any more damage from happening. I’m also accused of altering logs, even though in my 6 years of writing for this blog and about various MMOs and after being incredibly involved with every single community I’ve joined, I’ve NEVER been accused of this before. The GMs finally get involved, and the clear cutting stops, but it’s a grey area, and they (the griefers) are within their rights to cut down whatever they want. I receive more tells from random members of their village, either checking to see if I am online, or where I am, or what I am up to. I keep putting them on ignore. They put all of my characters on their KOS list, which I don’t mind because I have absolutely no intention of going to their deed, they’ve also put the neighbours on KOS, which is fine by all of them. The best part is that I’ve played for months now without any issue until these people came along and I was made CA. I have sent in all my logs and proof that they’re trying to intimidate and causing distress, but because it’s all within the ‘rules of the game’ there’s nothing anyone can do. It’s caused me to want to just stop playing, which is a shame because I really enjoy Wurm. There are even PVP servers set up for this, which is where these players came from. My best bet (at this moment) is to hope they simply go away and get bored again in time. In the mean time, my stuff is all deeded, and secured. They can cut down the entire forest that I’ve planted, but my little tiny area of land is safe for now. 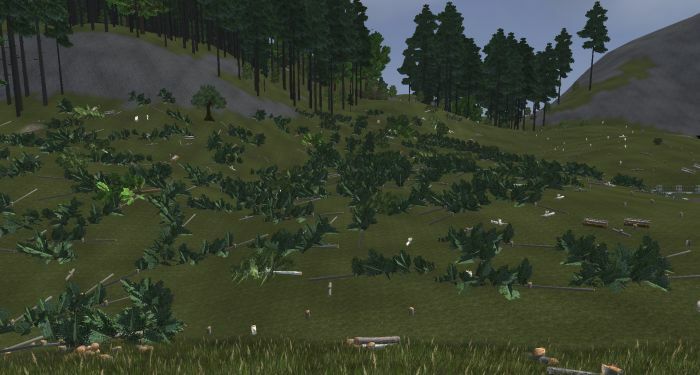 It took me approximately 8 hours on two accounts to fix up the cut down trees, but it got done. Many thanks to those who helped out. I won’t be re-planting any time soon because I know it will just get chopped down again, but it’s a start. Honestly, I just wish more could be done. It’s been a very frustrating two weeks in game. It always leaves a bad taste in my mouth when players intentionally grief or try to hurt other gamers. I hope you get through this and still enjoy your experiences with Wurm. I am so sorry to hear about the greifing you and your neighbors in WURM. It is a sad fact that these bullies exist in every MMO, as they do in life. I wish I could play the game and help out, but alas, the game crashes on me before I can even get to the starting area. However, all is not lost. This can be seen as an opportunity as well as a harrassment. Long ago, and far away, when I used to be in Britannia, I played on Sonoma Shard (’97 seems like a long time ago now). As a new player, I was based out of Minoc, working the mines there (trying to become a Grand Master Blacksmith). Miners always were naked in those times to save every ounce of weight. (carrying the ore was heavy; and could, in fact, encumber you to the point of not being able to move at all.) We miners had nothing but our mining picks and shovels; no weapons, or armour or reagents for spells. There was a PK named ZUG ZUG in those days, who was the terror of the mines. Everyday he would show up and slaughter the hepless miners, trying to build up his vile reputation. We were easy prey, like shooting fish in a barrel! Shouts of “PK!”, “PK!” would echo from the halls, as miners scattered in all directions, or fell victim under his blows. we started to wear him down. Miners would die, run to a healer for a rez, and run back to rejoin the fight! (just like a raid in EQ2 against a boss MOB). Slowly, step by step, we pushed him back, until he finally turned and fled, with an angry crowd of pick-wielding miners in hot pursuit! Adventurers in the town watched, doubled over in laughter. Some offered to form a ‘posse commitatus’ to help guard the mines. ZUG ZUG’s reputation as a PK was seriuosly damaged, and he was never seen in the mines again. It was one of the most satisfying experiences I have ever had in any MMORPG, and it made an impression on me. I have been an advocate of community ever since. If players work together, as a community, they can shape the climate of their server, and they can render the ZUG ZUGs of their respective cyber worlds impotent. Best of luck, and do keep us updated both on how you choose to deal with the situation, and how it turns out. Pretty sure these people know about you and your blog. Me thinks they came to your server solely to grief you. Your successes in game probably made them more inclined to do so. Shame really and i’m sorry for you and your groups experience. And like Devalyne above me said, these people are probably sad and pathetic in the real world so they act out in a fake world. We starting talking about Wurm at about 32:20. At that point, only the first break-in had happened, and the GM response was causing alarm. Largely the fact that we were being told things that we knew were not true. Would you say the GMs “can’t” do anything about this or don’t want to? 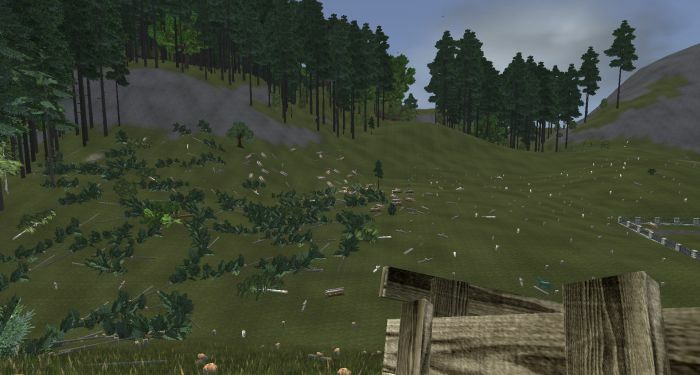 It seems that if a small MMO like Wurm is set up in such a way as to allow destruction of property it has to be expected that destruction of property will happen. It also seems to be a very odd design decision to create separate PvE and PvP shards but then put in a portal that allows characters to travel between the two. It’s not like there’s a huge corporation here with people remote from the game setting rules. Presumably these decisions are made by the people actually designing as well as running the game. At best it suggests that they’re indifferent to this kind of behavior. Given the choices they have made in setting up the way the game and rulesets work, it might be argued that they are broadly in favor of it. If they wanted a safe PvE environment in which threat and challenge was provided solely by the environment they could easily provide it but they’ve chosen not to do so. Also if they were really interested in providing a professional service shouldn’t they keep logs server-side? If the GMs are relying on players involved in a dispute to provide the logs that would be used in evidence, how can that possibly work? I hope it gets sorted out for you soon but I can’t see how you can trust the people behind the game in future even when it does. Even if the clearcutting is within the rules, the continued PMs are personal harassment, IMO. Stargrace has only mentioned a small portion of what’s gone on. It’s quite a bit worse than all that, especially when you consider the initial GM responses to the break-ins. This has ruined Wurm for me. The complete inability for the Wurm team to prevent such a campaign of harassment is mind-boggling. Sorry to hear about this :( It is a shame that these types of people can’t just stay on their own PvP server and play with others who signed up for that type of behavior, but I guess it’s how they get their excitement. Says a lot about their real lives, I’m sure. I hope you don’t quit Wurm over this, although I wouldn’t blame you. I’ve quit over very similar circumstances before, only to come back a few months later and everything was fine. Best of luck with everything! @Werit – you have to pay extra money for guards, 2s to hire and 1s extra per guard a month, so I don’t have guards. The guards also kill creatures that walk onto your deed which I don’t want them to do, another reason I have no guards. Technically, I shouldn’t have to have guards to prevent this stuff from happening, as it’s a PVE server. Also, yes a lot is happening off-deed. How does the Kill on Sight stuff work? Can you use that to prevent them from breaking in to your deeded land? Or is this all happening off of your deed?